Professional Naval Architecture and Engineering.. NAVAL ARCHITECTURE & DESIGNEngineering Works..
Project managers can have the responsibility of the planning, execution, and closing of any project. Navaltis has extensive experience providing direct project management, planning or technical support for your new build, refit, or proposal project. Navaltis provides a comprehensive service for projects design, creating some of the most enduring and timeless projects of the modern age. With a unique and dynamic approach to this discipline, Navaltis creates projects that capture the visions of our clients. We are as comfortable recreating classic lines as designing revolutionary and contemporary profiles. Successful custom projects are born from spirit, vision, design, planning, management, and experience. We understand that excellence is the expectation. We believe that a custom projects is not a prototype. The key to Navaltis is that we listen to our clients' requirements, enabling us to share their vision and helping to making each project unique. From every aspect, The NYD50 is a prefectly proportioned work of art. It is a design of elegant composure and supreme functionality. 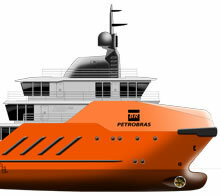 The DSV130 is ideally designed to shallow water dive assistance for FPSO operations. To get news and learn new projects and activities, please signup your e-mail.